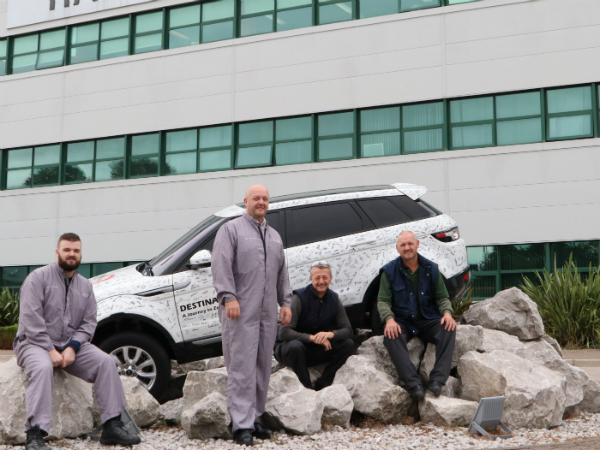 We often say that Halewood is like one big extended family but working at JLR also runs in the family for many of our employees. We met up with three groups of relatives who balance family ties with building cars. The Thurston Clan is one of our largest Halewood family’s. We met up with half of the clan, Ged, Alan, Paul and Jay. Alan, Ged and Paul are brothers and Jay is Ged’s son. But the family connection doesn’t stop there. On a different shift you can find a brother-in-law and three nephews (or Jay’s cousins) all at Halewood. Combined the Thurstons have given a massive 100 years of service to Halewood. The family like to keep work time and family time as separate as possible but some do commute to work together which saves the family a few quid and helps us with our car parking spaces. Thanks gents. Ged manages both his son Jay and a nephew in the paint shop, which can make for some interesting conversations at family gatherings. Meanwhile twins Teresa and Bethan Phillips, who started at Halewood as apprentices, knew there was no option but to work together in engineering. The twintastic female engineers are a rare sight indeed but growing up with engineer parents meant they had decided their fate from a young age. The pair came to the UK from South Africa when they were just seven years old and have spent the last five years working through our Advanced Apprenticeship, and passed with flying colours. After moving out of their parents’ home Teresa and Bethan now live together just a stone’s throw away from the factory. This allows them to walk to work together and catch up on the latest gossip. Sometimes the pair will also meet up in work, but it is usually business talk as they share a spanner or other tool, or help solve a problem together. Bethan said: “It is good working together as we can talk about work at home if we need to. We both understand the issues and sometimes can help each other out with a different solution to a problem. Teresa added: “We have started going swimming together after work now and that helps us to relax, unwind and de-grease!” They say a girl’s first love is her dad which may explain why Jessica Broady followed in her father’s footsteps into a career at JLR. David Broady and his daughter enjoy working at Halewood together but due to shift patterns they don’t get to see each other very often in work. Dave is based in Trim & Final whilst Jessica works for DHL in the Admin Block. Combined they have clocked up 20 years at Halewood. Jessica has previously worked in the plant for JLR in both the Body Shop and in Trim and Final. “I really enjoy working here and the move across from JLR to DHL has been good. I have some great colleagues around me,” said Jess.